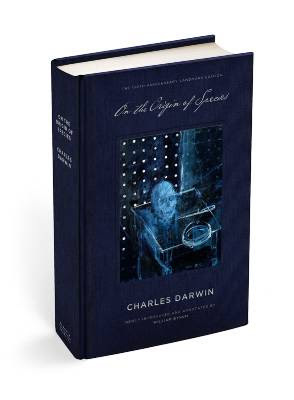 The Paper Cuts blog has a brief post about Penguin's 150th anniversary edition of Darwin's On the Origin of Species, which features a new painting by Damien Hirst commissioned specifically for the book cover. Read the Paper Cuts post and what Hirst has to say about the painting. That's a very interesting painting. I'm finally reading Origin of Species this year for a course I'm taking. Thus far, I find some of the ideas intriguing, but I'm having a hard time "getting into" the book...I often find myself struggling to stay awake. This painting is gripping and intense...something the book is thematically even though it doesn't read that way to me. Anyone else think this looks like it would be better suited to the 150th Anniversary of The Raven by Edgar Allen Poe? A skull, a knife, what looks like an ashtry, some dots. . . and this says what about the theory of evolution? I'm sorry to sound cynical but this really seems like a case of "I've got this really cool painting, what can I put it on?" All the rationale behind using the painting is silly: an "X-ray-like quality to it, as if it is revealing something about the structure of the objects painted." What? Please. That's weak. Nice cover -- too bad it has nothing to do with Darwin. Christian: I'm more or less with you. Not sure what to make of what Hirst's comments on the Guardian site.